Chlamydia pneumoniae antigens, nucleic acids, or intact organisms have been detected in human atheroma. However, the presence of antibody does not predict subsequent cardiovascular (CV) events. We performed a systematic review to determine whether the detection of C. pneumoniae DNA in peripheral blood mononuclear cells (PBMC) was associated with CV disease. We sought studies of C. pneumoniae DNA detection in PBMC by polymerase chain reaction (PCR) among patients with CV disease or other clinical conditions. We pooled studies in which CV patients were compared with non-diseased controls. We analyzed differences between studies by meta-regression, to determine which epidemiological and technical characteristics were associated with higher prevalence. Eighteen relevant studies were identified. In nine CV studies with control subjects, the prevalence of circulating C. pneumoniae DNA was 252 of 1763 (14.3%) CV patients and 74 of 874 (8.5%) controls, for a pooled odds ratio of 2.03 (95% CI: 1.34, 3.08, P < 0.001). Prevalence was not adjusted for CV risk factors. Current smoking status, season, and age were associated with C. pneumoniae DNA detection. High prevalence (>40%) was found in patients with cardiac, vascular, chronic respiratory, or renal disease, and in blood donors. Substantial differences between studies were identified in methods of sampling, extraction, and PCR targets. C. pneumoniae DNA detection was associated with CV disease in unadjusted case-control studies. However, adjustment for potentially confounding measures such as smoking or season, and standardization of laboratory methods, are needed to confirm this association. Since Fabricant et al demonstrated infection-induced atherosclerosis in chickens in 1978 , a number of viruses and bacteria have been investigated for a possible association with human atherosclerosis. The majority of investigators have focused on the putative role of the gram-negative, intracellular bacterium Chlamydia pneumoniae in atherosclerosis [2–4]. Indirect evidence of a possible association between C. pneumoniae and atherosclerosis was first found by Saikku et al in 1988, who measured circulating C. pneumoniae-specific IgG antibody by micro-immunofluorescence in patients with acute or chronic heart disease . In a review of the existing literature as of 1997, Danesh et al found a relationship between C. pneumoniae IgG seroprevalence and heart disease, primarily based on case-control studies . In a subsequent meta-analysis that pooled 15 prospective studies, Danesh et al found no over-all relationship between C. pneumoniae IgG seroprevalence and subsequent cardiovascular events after adjusting for age, gender, smoking, and socio-economic status . Similarly, in 3,168 patients enrolled in the Heart Outcomes Prevention and Evaluation study, we found no consistent relationship between C. pneumoniae IgG or IgA positivity and subsequent cardiovascular events during 4.5 years of follow-up (Smieja et al, unpublished). In aggregate, these sero-epidemiologic data suggest that C. pneumoniae is not an important cause of cardiovascular disease. Pathological studies of arterial wall provide more direct evidence for an association between C. pneumoniae and human atherosclerosis, albeit with marked variability between laboratories . Using electron microscopy, chlamydia-like elementary bodies have been observed in atheroma . Using immunohistochemistry with specific monoclonal antibodies, C. pneumoniae antigen has been detected in atheroma and localized to macrophages, endothelial cells, and smooth muscle cells in vitro and in vivo[10–12]. Polymerase chain reaction (PCR) has been used to amplify C. pneumoniae-specific nucleic acids within atheroma, and localization to abnormal but not to normal arterial wall has been demonstrated . Fifteen arterial specimens were analyzed by nine laboratories using 16 PCR techniques, with the detection of C. pneumoniae DNA in at least one specimen by six of nine laboratories . Over-all, 9% of specimens were positive, suggesting low copy number and large inter-laboratory variation in extraction efficiency, sensitivity, or specificity of the PCR methods. Using reverse transcriptase (RT)-PCR, C. pneumoniae-specific RNA has been demonstrated in lesions, implying that the bacteria are viable and transcribing specific RNA . Finally, in a small number of patients, viable C. pneumoniae have been cultured from cardiac  and carotid vessels [17, 18] and from aortic aneurysms . In aggregate, these molecular data demonstrate that C. pneumoniae or its antigens and nucleic acids are found in human atheroma. Thus, a major discrepancy exists between the widespread detection of C. pneumoniae in atheroma, and the lack of attributable risk in sero-epidemiologic studies. A key question is whether C. pneumoniae IgG or IgA correlates with the presence of C. pneumoniae in plaque. Campbell found no correlation between C. pneumoniae IgG by micro-immunofluorescence and the presence of C. pneumoniae in plaque. Similarly, Maass  and Berger  found no correlation between serology and DNA in plaque. Thus, C. pneumoniae serology may be a poor predictor for C. pneumoniae in plaque, and the lack of a prospective association between serology and cardiovascular events may therefore not be relevant. Hence, the question of whether C. pneumoniae in plaque contributes to atherosclerotic initiation or progression or to clinical events remains unanswered. In this paper, we review studies of C. pneumoniae DNA detection in peripheral blood mononuclear cells (PBMC), to determine whether this would be a superior epidemiologic tool for prospective studies assessing the contribution of infection to human cardiovascular disease. We performed a MEDLINE search (1980–2002 inclusive) using the terms "Chlamydia pneumoniae", "Chlamydophila pneumoniae", "Chlamydia TWAR", "atherosclerosis" as major headings or text words combined with "nucleic acid" or "polymerase chain reaction" as text words. We sought human studies in which nucleic acids, antigen, or intact C. pneumoniae were detected in peripheral blood. We also sought studies in which these were correlated with the tissue presence of C. pneumoniae by antigen detection, nucleic acid amplification, or culture. For sentinel papers, we searched for citations in the Science Citation Index to identify recent papers using similar technologies. We searched through the citations of found manuscripts as well as searching the abstracts of infectious diseases, microbiology and cardiology meetings between 1998 and 2002. Studies with control patients were entered into Review Manager 4.04 and a pooled odds ratio was calculated using a random effects model. We identified 18 studies in which circulating blood C. pneumoniae DNA detection was undertaken, as summarized in Tables 1 and 2. The majority of these involved cardiovascular patients, and the remainder examined respirology or nephrology patients or blood donors. Boman et al, working in Sweden, first demonstrated the detection of C. pneumoniae DNA in PBMC of cardiac patients . They found a prevalence of 59% of patients undergoing coronary angiography, using a nested PCR targeting an outer membrane protein (ompI) gene. Prevalence was also high in middle-aged blood donors (46%), with a higher prevalence in cases than controls. A number of investigators have corroborated Boman et al's observation of circulating C. pneumoniae DNA in peripheral blood of cardiac patients, albeit with widely varying estimates of prevalence (Table 1). We identified eight other studies, including seven published manuscripts [21, 23–28]. and one abstract (Da Costa et al, Proceedings of the Fourth Meeting of the European Society for Chlamydia Research, Helsinki, Finland, 2000), in which cardiovascular patients were compared with controls. These included patients undergoing coronary angiography or angioplasty, vascular patients, patients with acute myocardial infarction or unstable angina, and patients with carotid atherosclerosis at ultrasonography. Controls consisted of blood donors, medical students, apparently healthy controls, or patients with normal coronary angiograms. The largest of these nine studies examined 1,205 British patients undergoing coronary angiography, and was conducted by Wong et al . They found a prevalence of 8.7% in patients with angiographically-proven coronary artery disease, versus 7.2% in those with normal coronary arteries. In sub-group analysis, they found an association between coronary atherosclerosis and C. pneumoniae DNA detection in men but not in women. However, the prevalence of smoking was higher in male cases (78%) than in controls (67%), whereas prevalence was similar in female cases (53%) and controls (51%). We examined the nine studies by meta-analysis (Figure 1), and found a pooled prevalence of 252 of 1763 (14.3%) in cardiovascular disease patients versus 74 of 874 (8.5%) in controls. The results were not statistically heterogeneous (Breslow-Day X2 = 12.3 on 8 degrees of freedom, P= 0.14). The pooled odds ratio, using a random effects model, was 2.03 (95% CI: 1.34, 3.08, P < 0.001), as illustrated in Figure 1. Thus, without adjustment for other cardiovascular risk factors, cardiovascular patients had a higher over-all prevalence of circulating C. pneumoniae DNA than controls subjects. Meta-analysis of circulating Chlamydia pneumoniae DNA detection in cardiovascular studies with controls. Odds ratios with 95% confidence intervals and pooled odds ratios calculated under a random effects model (Review Manager 4.04). In Table 2, we summarize nine other identified studies which examined the prevalence of C. pneumoniae DNA in PBMC. In three studies of cardiovascular disease [29–31], prevalences of 27.3% to 47.0% were observed. In two studies of chronic obstructive pulmonary disease, prevalences of 24.0%  and 47.6% (Blasi et al, Proceedings of the Fourth Meeting of the European Society for Chlamydia Research, Helsinki, Finland, 2000) were observed. The highest prevalence, 60.0%, was found in a small study of patients undergoing peritoneal dialysis . Among blood donors, prevalence was 16.7% in Australia , 46.2% in Italy , and 8.9% in the United States . The studies by Bodetti and Timms , and by Haranaga et al , both corroborated PCR results by detection of C. pnuemoniae-specific antigen in circulating mononuclear cells. We identified two studies in which DNA was sought concurrently in atheroma and in PBMC [21, 30]. Blasi et al examined 41 patients undergoing aortic surgery . Sixteen patients had C. pneumoniae DNA detected concurrently in the resected aneurysmal tissue and in PBMC, three in PBMC alone, and one in arterial wall alone. Thus, 16 of 17 (94.0%) of patients with C. pneumoniae in arterial wall were identified by PCR of PMBC. Berger et al examined PBMC and resected arterial tissue from 60 vascular disease patients, including carotid and peripheral arteries and aortic aneurysms . C. pneumoniae DNA was detected in 12 plaques. Five of these 12 (42.0%) were also PBMC DNA positive. Conversely, 5 of 12 (42.0%) PBMC DNA positive patients were also DNA positive in plaques. No statistically significant correlation between C. pneumoniae DNA presence in plaque or PBMC was found. Furthermore, there was also no correlation between the amount of C. pneumoniae DNA in plaques and in PBMC. A putative relationship between age and PBMC DNA prevalence was found by Bodetti and Timms , with highest prevalence in patients < 35 years (5 of 22, 23%) and > 50 years (3 of 13, 23%) compared with those aged 35 to 50 (2 of 25, 8%), but the sample sizes are too small to allow meaningful inference. Berger et al  found that younger patients (mean 59 versus 68 years, P < 0.05) were more likely to have C. pneumoniae DNA in PBMC. By contrast, Iliescu et al  found an association between older age and C. pneumoniae DNA detection (62.5 versus 51.9 years, P = 0.01), whereas Haranaga et al  found a lower prevalence among older blood donors. No clear relationship with gender was identified in any study. A relationship between smoking and C. pneumoniae IgG or IgA seropositivity or titre level has been previously demonstrated [37, 38]. Boman et al found an increased prevalence of smoking among patients with C. pneumoniae DNA in PBMC, although the association was not statistically significant . Smieja et al found a strong and statistically-significant relationship between C. pneumoniae DNA in PBMC and smoking, with 10.0% prevalence in non-smokers, 9.0% in former smokers, and 25.0% prevalence in current smokers . In that study, current smoking was associated with C. pneumoniae DNA positivity independent of age, gender, and season (OR = 4.5, P = 0.004). This relationship was recently confirmed in COPD patients, in whom current smoking was associated with C. pneumoniae DNA detection in PBMC or sputum (OR = 2.6, P = 0.04) . Of interest, Berger et al found a relationship between current smoking and the presence of chlamydial DNA in atherosclerotic plaque . Smieja et al found a strong relationship between C. pneumonia DNA detection and season. Among cardiology, respirology and family practice patients in studies spanning four separate Canadian winter seasons [27, 32] (Smieja et al, unpublished), seasonal variation in prevalence was seen with highest prevalence between February and April (OR = 3.6 to 6.2), and lowest prevalence between June and October. No other reported study has adequately examined seasonal prevalence, but potential inter-month differences were noted in three studies. Rassu et al  reported higher prevalence among Italian blood donors in February (57.6%) compared with October (37.9%). Haranaga et al  found a lower prevalence in October and November (0 of 137, 0.0%) compared with August or September (21 of 100, 21.0%). Berger et al reported that aneurysmal plaque was DNA positive more often in May (25.0%) or June (50.0%) than in July to October (0.0 to 8.0%, P < 0.05). Blood sampling, extraction, and PCR targets are summarized in Tables 1 and 2. Generally, Ficoll-hypaque centrifugation of 5 to 10 mL of EDTA blood was used to isolate PBMC. In four studies by two research groups, cell preparation tubes (CPT, BD Vacutainer Systems, Franklin Lakes NJ) were used. No studies were found for a direct comparison between Ficoll-hypaque and CPT methods. Study investigators sampled 200–1000 μL of PBMC, extracted into a volume of 40–200 μL, and used 3–50 μL for the PCR reaction. Thus, a total volume of 0.15 to 2.50 mL of whole blood was sampled in the final PCR(s) of these various studies. Among eight studies in which sufficient details were given to calculate the total blood sampled, higher DNA prevalence was associated with greater sampled blood volume (X2 for linear trend = 55.0, P < 0.001). Two methods were used for DNA extraction from PBMC: phenol-chloroform or Qiagen QIAamp DNA mini-kits. Examining only cardiovascular patients to enable valid comparison, prevalence was 188 of 1195 (15.7%) extracted with phenol-chloroform, compared with 64 of 568 (11.3%) extracted with Qiagen columns (mean difference = 4.5%, 95% CI: 1.1 to 7.8%). Eight of 18 studies used a nested PCR based on the ompI gene of the major outer membrane protein (MOMP) described by Tong and Sillis , whereas other studies used a variety of nested and non-nested PCRs targeting MOMP, 16s DNA, heat shock proteins, or other targets. Examining only cardiovascular patients, prevalence was higher using the Tong and Sillis nested MOMP PCR (95 of 316, or 30.1%) than with the remaining assays (143 of 1214, or 11.8%), with mean difference = 18.3%, 95% CI: 12.9, 23.7). However, the latter group was heavily influenced by the low prevalence of 79 of 913 (8.7%) in one study , which used a nested assay directed at a different MOMP target. Two studies examined whether C. pneumoniae DNA detection in PBMC correlated with its presence in atherosclerotic plaque, and reached different conclusions. Further studies are required to validate circulating DNA detection as a surrogate for bacterial presence within atherosclerotic plaque. The prevalence of C. pneumoniae DNA detection in PBMC was found to vary widely: between 0.0% and 46.0% among controls, and between 4.2% and 59.4% in patients with cardiovascular disease. Using meta-analysis, we demonstrated that circulating DNA prevalence was higher among cardiovascular patients than among controls. However, lack of adjustment for potentially confounding variables such as smoking, season, age and gender may negate these results. Indeed, in a recent study of 310 coronary angiography patients and 102 concurrently-recruited family practice controls, adjusting for smoking and season, we found that C. pneumoniae DNA prevalence was less common among heart disease patients than in controls (Smieja et al, unpublished). Addition of this unpublished study would result in a non-significant association between C. pneumoniae detection and cardiovascular disease (pooled OR = 1.6, 95% CI: 0.7, 3.5, P = 0.22). Further studies with concurrent controls, matched or adjusted for age, gender, smoking and season, are required to conclude whether C. pneumoniae DNA detection is associated with cardiovascular disease. We caution that meta-analysis of non-randomized data may be quite misleading due to heterogeneity of the control groups. Possible explanations for the found association include selection bias, publication bias, confounding by other cardiovascular risk factors, or a true association (whether causal or innocent) between C. pneumoniae and atherosclerosis. Selection bias may be acting in the selection of cases (which represent primarily patients with prevalent, chronic disease and not incident cases), or in the selection of controls. The use of blood donors as controls selects a group in whom many cardiovascular risk factors are less prevalent than in the general population. A second possible bias is of publication bias, in that positive results may have been more likely to get published. 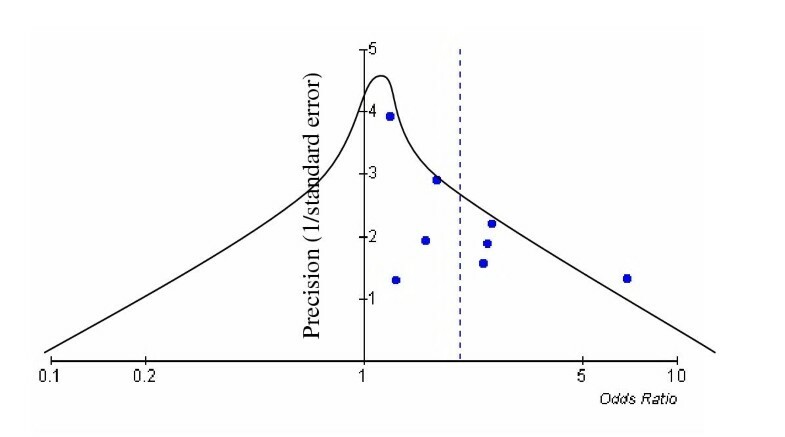 This is suggested by examination of a funnel plot (Figure 2), in which the estimated odds ratio of the association between C. pneumoniae DNA detection and vascular disease is graphed against the precision of the estimate. Ordinarily, a funnel shaped with the apex in the middle of the funnel should be seen, as indicated on the diagram . The lack of symmetry in the graph suggests that there may be a number of unpublished studies in existence, or that bias in the selection of cases or controls may be playing a role. Funnel plot of Chlamydia pneumoniae DNA detection (Review Manager 4.04). Precision of estimate (reciprocal of standard error) versus odds ratio for studies of circulating C. pneumoniae DNA detection by cardiovascular disease status compared with disease-free controls. The dotted line indicates the pooled odds ratio of the studies at 2.0. The curve illustrates a funnel plot centred about the most precise study, in which an equal number of studies are expected in the left and right tails. Asymmetry of the funnel plot suggests publication bias, or bias in selection of cases or controls. Confounding may be playing an important role in any found association with cardiovascular disease. We demonstrated a strong association between PBMC C. pneumoniae DNA detection and current smoking status , and Berger et al  demonstrated that current smokers are more likely to have C. pneumoniae DNA in atherosclerotic plaque. A more detailed smoking history, or laboratory measures of smoking metabolites such as plasma cotinine, may be useful to better control for confounding by smoking status. We also found a strong association with Canadian winter or spring season in three of our studies [27, 32] (Smieja et al, unpublished), with highest prevalence between February and April. Studies by Rassu et al  and Berger et al  suggest similar seasonal patterns in Italy and Germany, respectively. Seasonal differences may be due to seasonal occurrence of acute C. pneumoniae infections in the community, reactivation of chronic infection, or, potentially, to seasonal differences in DNA extraction efficiency or PCR assay performance. Most studies did not recruit for sufficiently long to observe seasonal patterns, and studies from various geographic locations are required to determine whether seasonality is a wide-spread phenomenon. Of interest, Boman et al's original study  recruited patients between April and May 1998. Similarly, other high prevalence studies (≥ 40.0%) such as Iliescu et al  (April to May, 1999), and Blasi et al  (December 1998 to February 1999) recruited during times these "high prevalence" months. Conversely, Wong et al  recruited between August 1998 and March 1999, and found prevalence of only 8.7%. Important implications of this seasonal hypothesis are that prevalence will be lowest between June and October, and that controls for patients need to be carefully recruited with matching by month. Berger et al's observation of a peak in C. pneumoniae DNA in atheroma during June , and of a lack of correlation with concurrent PBMC DNA, suggests that there may be some delay between PBMC DNA detection and its presence in atheroma. However, Berger et al did not sample between January and April, months during which C. pneumoniae DNA prevalence may have been higher in both PBMC and in atheroma, and during which time a better correlation might have been found between the two sites. In summary, these data suggest that C. pneumoniae DNA detection in PBMC should be performed, as a minimum, during winter and spring months, and controlled for smoking status. Any comparisons with controls should also be controlled for age and gender, although the relationship between these factors and C. pneumoniae DNA prevalence remains unclear. Boman and colleagues have reviewed many of the technical aspects of C. pneumoniae DNA amplification in general [8, 41], and of PBMC DNA detection in specific . In this review, we examined four important differences in technique which require further investigation: the volume of blood sampled, type of blood specimen used, DNA extraction methods, and PCR primers. We found that the total volume of blood sampled in the PCR reaction was related to higher detection. We previously demonstrated a relationship between low copy numbers and the proportion of PCR replicates that were positive . Solutions to this sampling problem include extracting a large volume of blood, and doing replicate PCRs to maximize detection. However, with larger volumes, inhibitors will also be more concentrated. This may be overcome by testing different concentrations. Commercial products are now available to simplify and standardize three aspects of testing: BD Vacutainer CPT tubes for blood collection as an alternative to Ficoll-hypaque gradient centrifugation, Qiagen QIAamp DNA mini-kits as an alternative to phenol-chloroform extraction, and a new commercial PCR assay from Abbott Laboratories. The commercial products save labour time but are more expensive. Our review suggests that phenol-chloroform extraction may have a higher yield than Qiagen columns, but inter-study comparisons may be misleading and a direct comparison is needed to validate this finding with paired samples. Experience with a commercial PCR assay has been published, and may enable meaningful comparisons between centres in the future . A MOMP nested PCR described by Tong and Sillis  was used in half of the identified studies. Somewhat higher prevalence was seen with this PCR than with other primers, but no firm conclusions should be based on a comparison between studies that used heterogeneous populations. However, they are in accord with our parallel comparison of five in-house published PCRs, in which we found that the Tong and Sillis nested PCR had superior clinical sensitivity for C. pneumoniae in PBMC despite similar analytical sensitivity . Regardless of the best "screening" test for detecting C. pneumoniae DNA in PBMC, additional methods of confirming the identification of C. pneumoniae are desirable . Such confirmation would ensure the early identification of false-positive tests, and ensure valid comparisons between tests. However, simply confirming that circulating C. pneumoniae nucleic acids are present does not imply that their detection is clinically relevant. Rather, confirmation is required to define an appropriate molecular measure for prospective clinical studies. There is good evidence that C. pneumoniae circulates in the bloodstream as a cell-associated infection. We  and others  have demonstrated that the plasma fractions of PBMC-positive patients were uniformly negative for C. pneumoniae DNA. However, it remains unclear which cells within the peripheral blood mononuclear cell layer contain C. pneumoniae. Peripheral blood mononuclear cells contain monocytes, dendritic cells, and lymphocytes, and may be contaminated with polymorphonuclear cells or platelets. Using CD14 monoclonal selection, Maass et al  demonstrated a prevalence of 27.0% C. pneumoniae DNA positivity among patients presenting to hospital with acute coronary syndromes. It is unknown whether this prevalence was higher than in whole blood or buffy coat alone. Kaul et al  used adherence to select CD14 cells and found that the CD3+ lymphocytes fraction was positive more often (10 of 28 patients, 35.7%) than the "adherent" fraction of CD14+ cells (3 of 28, 10.7%). Further work is required to determine which cells are infected, and whether cell enrichment would improve detection compared with mononuclear cell preparations. Potential methods for confirming whether C. pneumoniae is present in PBMC include use of a second DNA-based amplification test, use of RNA-based methods, or detection of antigen. These will be discussed in the same order. As more sensitive methods are developed, an alternate DNA-based nucleic acid amplification test with a different amplification target may be used to confirm a specimen as a true positive. However, due to low copy number and sampling error, confirmation of only 30–80% of such samples should be expected [14, 43]. Use of higher blood volumes and extraction of a greater proportion of infected cells may improve initial detection as well as confirmation. Development of methods of quantitating C. pneumoniae in whole blood and PBMC have been developed using TaqMan or LightCycler real-time PCR detection technologies, and Berger et al used a quantitative assay for the detection of C. pneumoniae DNA in PBMC and atherosclerotic plaque . Three replicates were run per specimen, and the number of negative runs was not reported. In our experience, only one of three replicates are positive in the majority of patients, indicating very low copy number [27, 43]. For such patients, quantitative methods are unlikely to improve detection, although studies of quantitation versus clinical importance may be informative. Alternatively, RNA targets may be used for confirmation of C. pneumoniae PBMC positivity. Gieffers et al  reported the use of a reverse transcriptase PCR (RT-PCR) targeting 16S RNA transcript, and demonstrated active RNA production by infected PBMC. In volunteers who took antibiotics prior to blood sampling, RNA was still detected, indicating that viable chlamydia were present and that antibiotics had not suppressed chlamydia in infected PBMC. Conversely, as with DNA-based validation, RNA-based confirmation is likely subject to the same sampling problems. An attractive alternative would be to use a different technology for detection of C. pneumoniae in PBMC. Bodetti and Timms  described the detection of circulating C. pneumoniae antigen in PBMC using a specific monoclonal antibody. Ten of 10 PCR positive PBMC specimens were also antigen positive, compared with zero of ten PCR negative specimens. Antigenemia was also assessed and reported in a recent paper by Haranaga et al . Wider experience with the sensitivity and specificity of this technique is required, and while it may emerge as a confirmatory test, the method is technically difficult and not suitable for a screening test. The detection of C. pneumoniae DNA in PBMC was associated with CV disease in unadjusted case-control studies, as summarized in this review, and is a promising test for further molecular epidemiologic studies. To verify this disease association, future studies will need to match or adjust for potential confounding by smoking, season, age, and gender. To ascertain the role of C. pneumoniae in cardiovascular disease and other chronic diseases, epidemiologists and other researchers need a sensitive, specific, and reproducible test that correlates with the endovascular presence of C. pneumoniae. To improve the sensitivity of PBMC testing, we recommend using the nested MOMP PCR and sampling large blood volumes. Studies are needed to optimize blood volumes and extraction methods, and to further validate circulating C. pneumoniae DNA detection as a surrogate marker for its presence in atheroma. We acknowledge Dr. Charlie Goldsmith for critical review of the manuscript. MS, JM and AP were responsible for conception of the manuscript, literature search, and manuscript writing. Statistical analyses were conducted by MS. JB and MC contributed to identification and assessment of relevant studies, and provided critical reviews of the manuscript. MS assumes over-all responsibility for the accuracy and integrity of the manuscript.